Happy 4th of July! To celebrate, I discuss a patriotic addition to Defunctland, America Sings. I couldn't get completely away from marching music, as "The Stars and Stripes Forever" played in the background. Also, as I mentioned, this attraction is not forgotten. Last year, Disney sold the following T-shirt to remember the ride (and take advantage of the current political mood). Regardless of the inspiration, I agree with this sentiment. Follow over the jump for the drinks to toast the holiday. 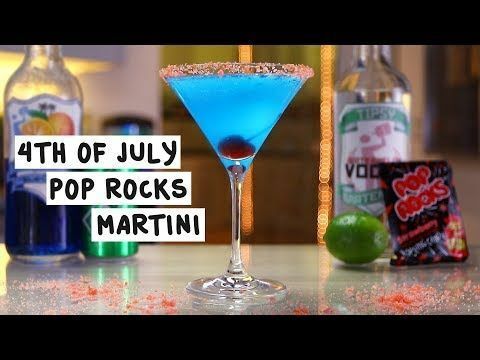 I am sharing two drinks for the holiday from Tipsy Bartender, beginning with one I missed last year, 4th of July Pop Rocks Martini where Skyy ties this part of the entry with the section above the jump by suggesting that drinking it is like going to Disney World. 1. Rim edge of martini glass in lime juice and strawberry pop rocks. Set aside. 2. In an ice filled glass combine watermelon vodka, blue curaçao and lime juice. Shake well. 3. Strain mix into rimmed glass and top with lemon lime soda. 4. Drop in a cherry. Enjoy responsibly! The next drink follows the fireworks theme for the holiday, American Firecracker. I'm not done with the holiday, as I plan on posting about the national anthem tomorrow. I already have a drink picked out. Stay tuned. *I wasn't feeling it today, but I might return to the theme next year.